O’Donovan Engineering, Coachford Co Cork. Leader in the design/manufacture and supply of livestock equipment for the Irish agricultural industry is celebrating 30 years in business this year. 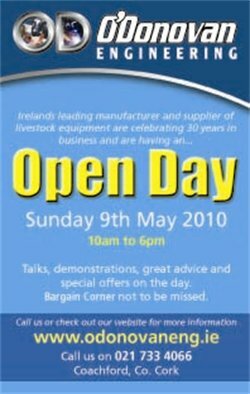 To celebrate this milestone, we are having an Open Day on Sunday May 9th from 10am to 6pm. * As part of the day Dr. Emer Kennedy B.Agr.Sc.,Ph.D. , Teagasc Moorpark will attend and talk about animal weighing and the benefits thereof. * Tom Ryan, Farm Buildings and Machinery Specialist, Teagasc Kildalton will also be attending to talk to farmers about cattle housing/parlour drafting and any other questions customers may have for him. * As part of this Open Day there will be animal weighing demonstrations/full product range display/advice/offers and competitions. * There will be a special bargain corner for end of line products which will have some great value deals for all sectors of the agricultural livestock industry.